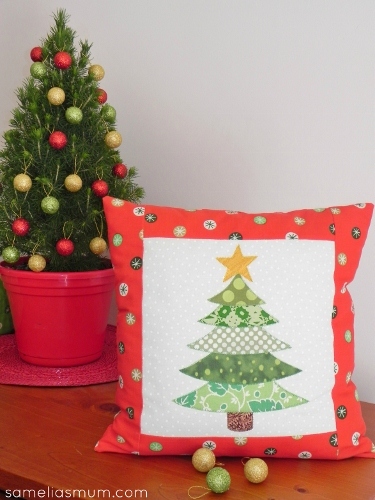 Make my fun and festive Oh Christmas Tree cushion by using up left over fabric scraps. Finished size is 34.5cm (13.5”) square. Two 2 ¾” strips and cross cut two 2 ¾” x 9 ½” and two 2 ¾”” x 14” strips. Trace the applique shapes onto the paper side of the vliesofix. Each layer of ‘leaves’ needs to be traced separately. Number as you go – it makes it easier when it comes time to assemble. Cut out the shapes roughly around the lines. Fuse the shapes to the back of the chosen fabrics and cut them out on the lines. Peel the backing paper off and lay them onto the cream tone on tone fabric (centred). Use the picture as a guide - NB: The dotted lines underlap. When the Christmas tree is centred and the star is in place, fuse in place with a hot dry iron. Attach your applique foot to your sewing machine and applique the tree with green/gold/brown thread. Charcoal or black thread would work well too. I used a small zig zag stitch. Alternately, you can blanket stitch the tree by hand. Sew a 2 ¾” x 9 ½” strip along to the top and bottom of the applique panel. Sew the 2 ¾” x 14” strips to either side of the applique panel. Pin the cushion front and back together with right sides facing and sew around the edges leaving an 8” opening on once side for turning. Clip the corners and zigzag stitch the edges. Turn out and push out the corners to nice neat points. Insert the 14” cushion insert and slip stitch the opening closed with matching red thread. If you make an Oh Christmas Tree cushion, I’d love to see it. Send me a photo or add the image to the Samelia’s Mum Flickr Gallery. This is lovely :) I wonder if I can fit in a project like this before Christmas Day arrives!!! It's so joyful ! I love it ! Thank you ! I turned the tree into a hanging. I'll try an & add a photo to flickr for you later when i'm on the desktop as all the photo's are on there. That is lovely. Thanks for offering a free pattern. Okay so it is April, but if I start some of my Christmas sewing now I just might get my projects done this year. This is a lovely pattern and just using it as a block and surrounding it with other Christmas themed fabric it would make a lovely wall hanging. Many thanks for sharing your talent.